Belgium, is not really known for being a country of large aircraft manufactures, however the Stampe SV-4 biplane designed in the early thirties by Stampe en Vertongen in Antwerp (Belgium), is one exception! After only 35 SV-4's were built, the company closed doors during the second World War, to resume production in 1947, under the new Stampe et Renard brand. While about 90 SV-4's were built in Belgium, more than 500 SV-4C's were license built in France and Algeria, by SNCAN (Sociéte Nationale de Construction Aeronautique du Nord). A few weeks ago, I was out flying my 1954 Piper Super Cub, in close formation with some other "Aviators". One of the other vintage airplanes in the four-ship formation, was a beautiful example of a SV-4C, built by SNCAN after WWII and restored by Raymond's Aircraft Restoration. The image was shot over lunch at the Aéro Delahaye Air Park in Verchocq; a residential Air Park in Northern France, which is every pilots dream! Living on a small grass airport with your aircraft parked in the "garage" below; what more can a pilot wish for! 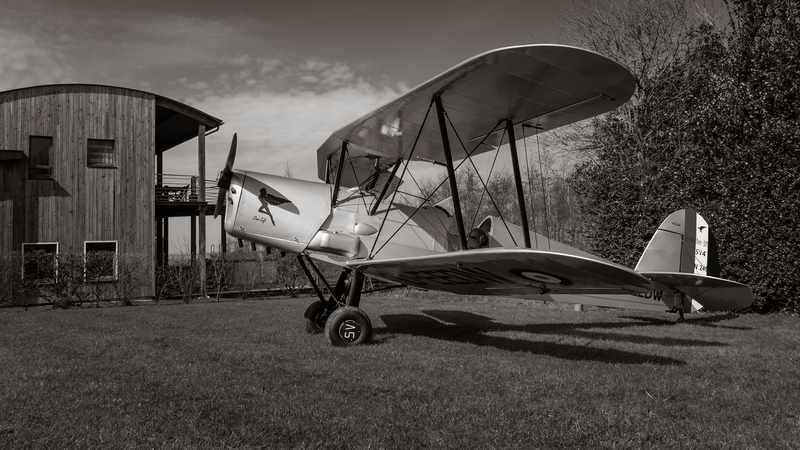 Seeing this almost 70 year old biplane, shining in the afternoon sun, was a memory that will be stored on the personal harddisk, but having it in the form of a photograph makes it all that much more memorable. I often get the question, if I don't like Lightroom for Black and White conversions, because I often use Nik SilverEfex instead... While I often go the SilverEfex way, Lightroom is definitively up to the task when it comes to B&W editing. On the image above, I actually tried emulating the same effect using Nik and wasn't able to fully do so in a reasonable amount of time. So, the answer is, I'll use whatever I deem best for the task! Remember: "I fly because it releases my mind of the tyranny of petty things" Antoine de Saint-Exupery. 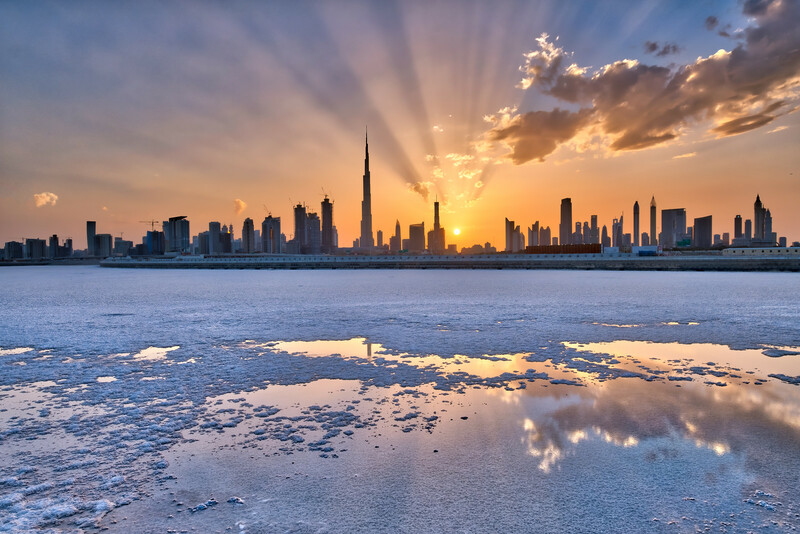 Always on the lookout for a new perspective to photograph the amazing Dubai Skyline, I went to one of my favourite spots of the Oud Metha road near Business Bay. The water of the man-made extension of the Dubai Creek, makes for an interesting foreground; sometime creating very nice reflections of the buildings of the "new Dubai". To my surprise the day I was there, the water level of the lake had almost completely drained/evaporated; leaving a residue of white salt on the bottom. Or did it just snow in Dubai? Beside the very unusual foreground, I was also attracted by sun-rays reflecting of the clouds and buildings. One of my main complains about the Fujifilm X-series cameras has been the lack of real use exposure bracketing. The -2 to +2 EV on the new X-Pro2 (review here) is definitively a step in the right direction! Just get rid of the 1/3 and 2/3 exposure bracketing options and replace them with +3 and -3 stops please! I'm regularly asked for the coordinates of certain locations; although I'm a big fan of sharing all kinds of photo info, I'm a strong believer in discovering good locations yourself by doing some online research; it is all part of the photographic process. There really is no excuse today with detailed satellite images on Google Earth and great landscape photography planning software like The Photographer's Ephemeris (TPE) or PhotoPills. End of rant! Earlier this week, I blogged (link here) about my positive photographic experience with the new Fujifilm XF 100-400 super telephoto lens, paired with the also new X-Pro2 camera body. Shot at the same place (Ras-al-Khor Wildlife refuge in Dubai) as the previously mentioned Flamingo shots, this gull billed-tern, was snapped as it passed a few hundred meters ahead of me. The image was made using the 8 frame per second CH mode with Zone Autofocus, in Continuous (C) mode. Having an effective 600mm (400mm x 1.5 crop factor) focal range, was useful but still not enough. 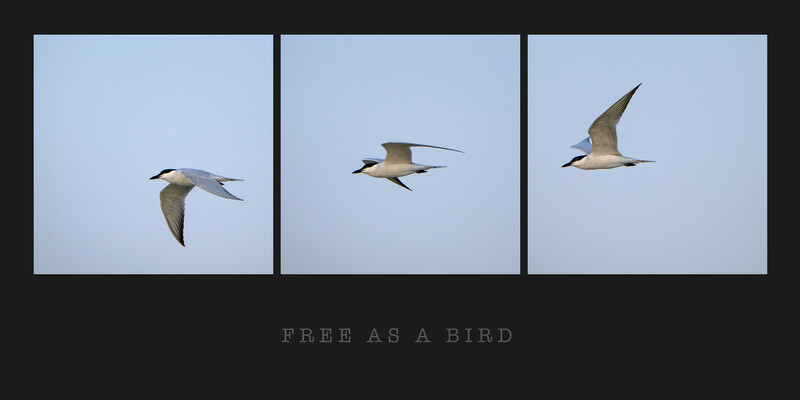 So I ended up cropping the 24Mpx X-Pro2 file a bit, to come up with the "Free as a bird" triptych below! More "Nature of the UAE images can be found here. When I reviewed the just announced, FUJIFILM XF 100-400mm F4.5-5.6 OIS WR lens (click here for review) mid January, I did have only a very limited opportunity to take the lens out on a typical long lens photo-shoot. Since I was very happy with the initial results and image quality, I realised straight away I would be "buying" the lens! By the way, unlike what I read online the other day, official X-photographers do not get their gear for free ! The number one reason I bought the lens, was to be used as my main "Airshow / Aviation photography" lens; such as for the shoot at the Red Bull Air Races in Abu Dhabi last month. End of April, I'll be attending a large warbird airshow in California (Planes of Fame, Chino) where both the 100-400 and 18-135 will be my main two go to lenses. Secondary, I also plan on using the lens for some wildlife photography and can already see how it will shine on an African wildlife Safari. Meanwhile, I took the XF 100-400mm and the new X-Pro2, to two spots in the UAE, to photograph some large birds. I started of at the Ras-al-Khor Wildlife Sanctuary, at the end of the Creek in Dubai; a completely fenced off area with three hides, of which presently only two are open for the public. I spend some time at the Flamingo hide; part of the sanctuary where up to 3000 Greater Flamingos live. While about a third leave the area over the hot summer months, there is always a good population visible from the hide. The 100-400 lens was perfect to photograph the Flamingos being fed and capture a few in flight. The focus was snappy using Zone focus and Single Shot mode, while for the birds in flight, I changed to AF-C with Zone focussing. Twice a day a ranger gives them a cereal based food supplement; a great moment to capture! A few days later I took the super telephoto to the Al Quadra lakes; a cluster of man-made lakes in the middle of the desert, where one can find more than a hundred different bird species. 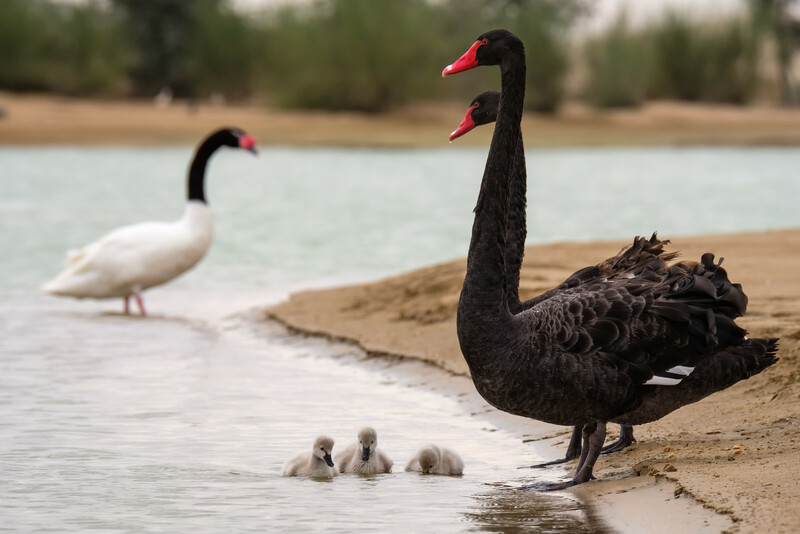 The most photogenic was a family of Black Swan. 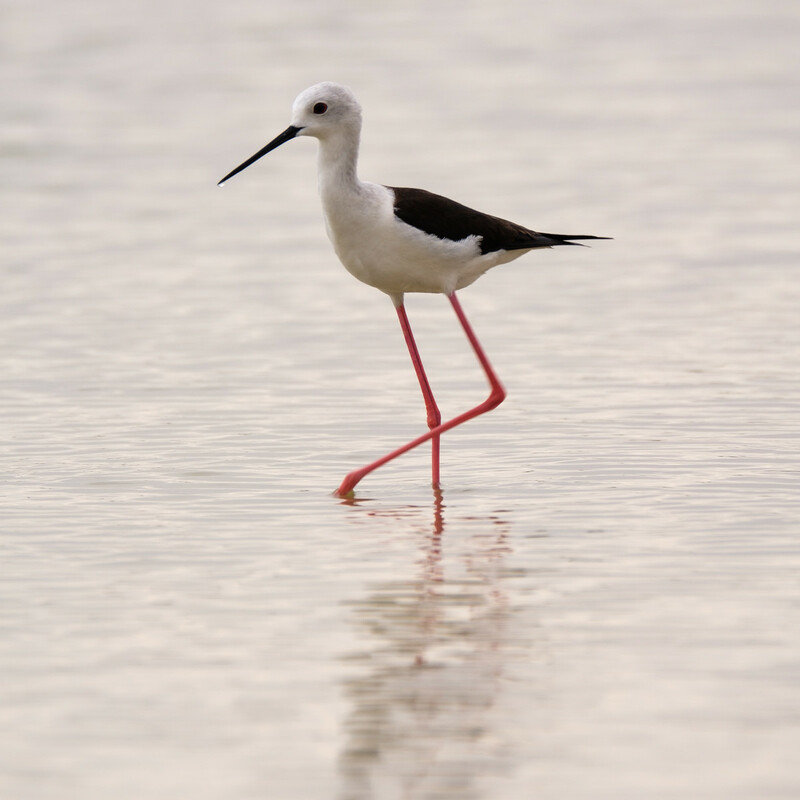 But also some smaller species like this Black Winged Stilt. Beside the ridiculously small lens-foot, I very happy with the new Fujinon XF 100-400mm lens. The image quality is top notch and the 5 stops of OIS (image stabilisation) works great. One can easily shoot the 100-400 handheld for several hours at a time! I've been using the new X-Pro2 for the above shoots and have quickly fallen in love with the new 24Mpx X-Trans III files. Although, I'm still tweaking my RAW file workflow somewhat, it will be hard to go back to my trusty X-T1/X-T10 the day I return the camera to Fujifilm Middle East! My home country has been in the news for the wrong reasons again... On the morning of March 22nd, two cowardly terror attacks at the Brussels airport and a downtown metro station, killed 32 people (not including the suicide bombers as they are not human to me!) and injured over 300 innocent people. More than a week later, the attacks still dominate the news and Belgium has once again been (rightly?) criticised for not taking enough action against terrorism. The small central European country I grew up in, has however a lot to offer! Something I wanted to show in my photography while I was on a weeklong visit last week. One of these scenic places is the small village of Damme, just North of one of the most touristy places in the Western part of Belgium; the city of "Bruges" (Brugge). Damme is dominated by a labyrinth of long straight canals with hundreds of high trees. Horses used to pull the boats along the canals when Damme was the main port for Bruges in the 12th century. Click here for a typical image of the canals. 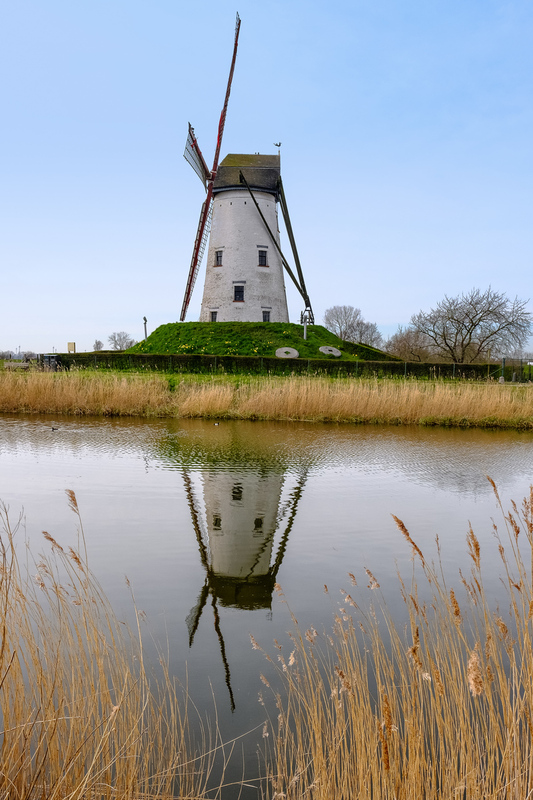 Along the main canal, called "Damse vaart", one can find what is probably the most photographed windmill in Belgium. The image below is of the Schellemolen in Damme; a windmill built in 1867 which was used for almost a full century. Given there were no interesting clouds the day I was there, I tried including the reflection in the water. More images of Belgium can be found here. I've been shooting exclusively with the new Fujifilm X-Pro2 for the last three weeks or so. For the ones that missed my X-Pro2 review, please click here. Remember, "When the winds of change blow, some people build walls, others build windmills".